Welcome to Abe & Louie’s — a world-class American steakhouse. Abe & Louie’s has always been recognized for its passion and expertise of wine selection. With more than 300 definitive options to choose from, both the novice and most pronounced connoisseur will find a wine to suit their taste. Abe & Louie’s cellar is stocked with wines sourced from respected vineyards across the world, ranging from modern blends to aged vintages. The philosophy of Abe & Louie’s wine program is to offer variety, value and a taste of our love for diverse flavors to each guest. Born out of this philosophy is the Tavistock Reserve Collection, our proprietary series of exclusive and reserve labels. By partnering with select vineyards and winemakers directly, we are able to create unique and exceptional experiences for our guests. Whether you sample the varietals of our own craft or choose another esteemed label, we guarantee a superior wine-tasting experience. 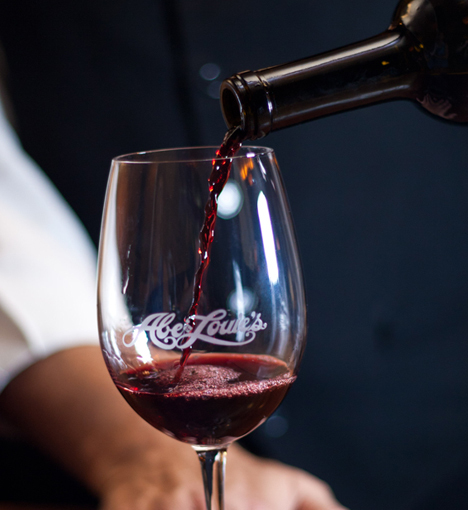 At Abe & Louie’s, we invite you to experiment or consult with our sommelier for the perfect pairing to your meal. Create memorable moments with an Abe & Louie’s dining experience. Send a traditional or electronic gift card to your special someone. Abe & Louie's is part of the Tavistock Restaurant Collection family.